Eliot Coleman, author of The Winter Harvest Handbook, says "sweet winter candy carrots are his most acclaimed winter crop." He states "the tastiness resulting from growing in the fall weather elevates the humble carrot to another plane." Many gardeners who have experimented with spring grown vs. fall grown carrots can agree with Coleman that they taste sweeter when grown in the cooler weather. The sweetness is a physiological defense against the cold. The carrot produces more sugars to prevent against ice crystal formation in the cells. These ice crystals can puncture and crush the cells. Fall grown carrots can be started by seed now. You may be tempted to plant the carrots where you just harvested your potatoes but it would be best to plant them where you just harvested your onions or in amongst your tomatoes. Potatoes and carrots being both root crops may share the same pests. Carrots do not like high nitrogen levels and the tomatoes if fertilized for the last time in the season have most likely used it all up. It is best to loosen up the soil about 8 inches. Excess organic matter in the soil may cause forked or twisted carrot roots. I like to dig a trench about 1/8 to ¼ of an inch deep and carefully spread the small seeds down the row. I then cover the seeds with soil and water them gently. Germination may take up to two weeks. Some gardeners may place burlap on top of their seeds to ensure consistent moisture or irrigate shallowly every few days. The seeds are so small that inevitably I must always thin them after they have germinated and reached about an inch tall. The goal is no more than 2 carrot plants per inch. This mandatory thinning of carrots does provide an opportunity to harvest the greens for pesto or fresh in a salad as they have a prominent carrot flavor. Without thinning you may not achieve the optimal size on your carrots. 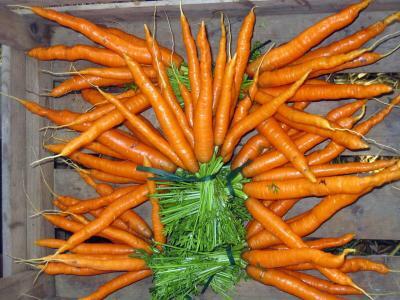 Most carrots take 50 to 80 days. Our average first frost date in Central Illinois is October 14th. It is best not to harvest until after first frost event and when the roots are at least ½ inch in diameter. Summer plantings covered in straw mulch can be left in the ground until a killing frost. Dr. Chuck Voigt, retired University of Illinois Vegetable and crops specialist, says "Carrots that are mulched can be harvested throughout the winter until the ground freezes. " If you still have the gardening bug this season, prepare now for candy carrots ready to harvest around you holiday meals and don't forget to mention they were freshly harvested.